Linfield manager David Healy says Warrenpoint Town will be eager to bounce back from a weekend hammering in Friday night's game at Milltown. Town were crushed 6-1 by Ballymena to leave them without a point and bottom of the table after five matches. 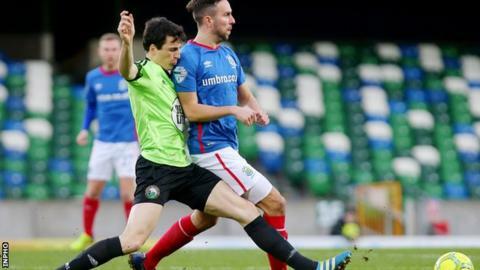 Linfield have made an unbeaten start to the campaign and the Blues will move top if they avoid defeat. "They'll be hurting and we know you always get a rebound effect after such a disappointing result," said Healy. He added: "They will be battered and bruised - the last thing they'll want is us going down there and running over the top of them." Warrenpoint were boosted this week with the signing of former Wolverhampton Wanderers goalkeeper Aaron McCarey. He could be a busy man this season with Town having already conceded 17 goals and boss Stephen McDonnell admitted that being on the end of another heaving defeat is a "massive worry". "If we are going to put in a performance like the one against Ballymena then it is a huge concern," he said. "We have to come up with some sort of idea to ensure it doesn't happen again and I will expect better from my players on Friday night. "It's over to the players now to regroup, pull together and try to get ourselves out of this situation." Newry City picked up an impressive three points against Cliftonville on Saturday and manager Darren Mullen is relishing an Oval meeting with in-form Glentoran. "We know they are going to be extremely difficult - they've started the season well," said Mullen. "But we go into every game looking forward to it. There's no fear within the camp." Sixth-placed Institute sit three points above Cliftonville as the teams prepare for a Solitude encounter. "Cliftonville are one of the top sides in the league and I don't expect anything other than a tough day day at the office," said Stute manager Paddy McLaughlin. "We always have belief, we have shown our quality and how hard the boys work - if you put all those together you have always got a chance."